Will Rose has taken home the coveted Chef of the Year title at bartlett mitchell’s annual company awards. Based at Reading Business Park, he scooped the top prize after competing in a three-phased competition, held in London. At the awards, bartlett mitchell, one of the UK’s leading independent caterers, also celebrated the talent and commitment of its employees with more than 21 individual and team awards across 11 categories. More than 300 members of the bartlett mitchell team attended the event, held at a central London venue, where they were treated to a Champagne and canape reception. Based on the company’s FOODIES values, the awards aim to recognise high achievers who demonstrate their commitment to the business and its activities. The full list of individual winners is below. 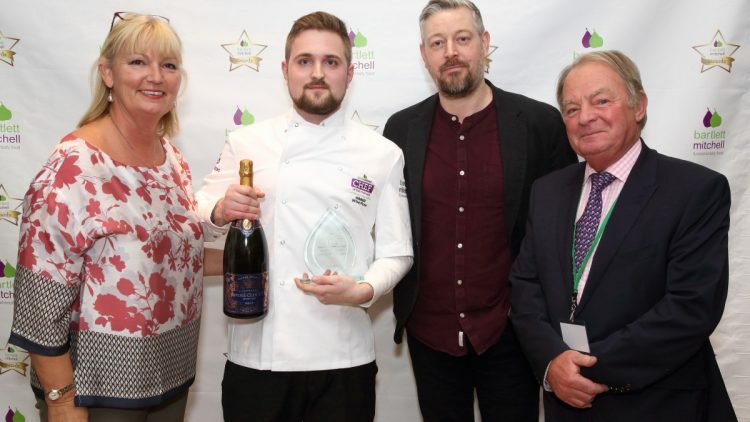 Will was presented the Chef of the Year award by Adam Byatt chef proprietor of the Michelin-starred Trinity restaurant and chef consultant at bartlett mitchell. Adam was also an awards judge alongside Michelin-starred chefs Mark Kempson, Kitchen W8, and Matt Worswick, the Latymer at Pennyhill Park. Wendy Bartlett, executive chairman of bartlett mitchell, said: “We’ve always stayed true to our values and our awards are a great way to celebrate the brilliant people we have in the business. All the success we have is down to the hard work, passion and commitment of so many people so we are really pleased to be able to come together to recognise these.